“Welcome to our beginning.” Anita and Brian had liked the thought, choosing that phrase to adorn the sign that greeted their guests. But it wasn’t until their wedding day actually arrived that they felt its true significance. The two met early on in college, clicking almost instantly. Fast forward five years—to Delaware Park on a perfect Buffalo spring day, where Brian proposed—and their friends popped out from hiding places to celebrate with them. He knew Anita would want it that way...and that extra touch made the moment that much more special to her. The best friends were excited to marry, but thought of their wedding as more as a celebration of their love rather than a defining moment of it. But when it arrived, both were struck with the emotion and importance of the day—and to her surprise, Anita cried during the ceremony. Anita's dress was the epitome of the look she wanted: “modern, fashion-forward and elegant.” Anita’s two-piece Rebecca Schoneveld gown was the first she tried on, and after letting it percolate, she came back with two bridesmaids and confirmed it was indeed the one. She paired the quiet statement with sleek chunky heels (a favorite) and a fresh floral headpiece, effortlessly worked into her loose half-do by Crown. Soft, muted, “not too formal” hues cast a relaxed backdrop for the day, echoing the warm comfort of the Foundry, with its brick and string-light dotted spaces. 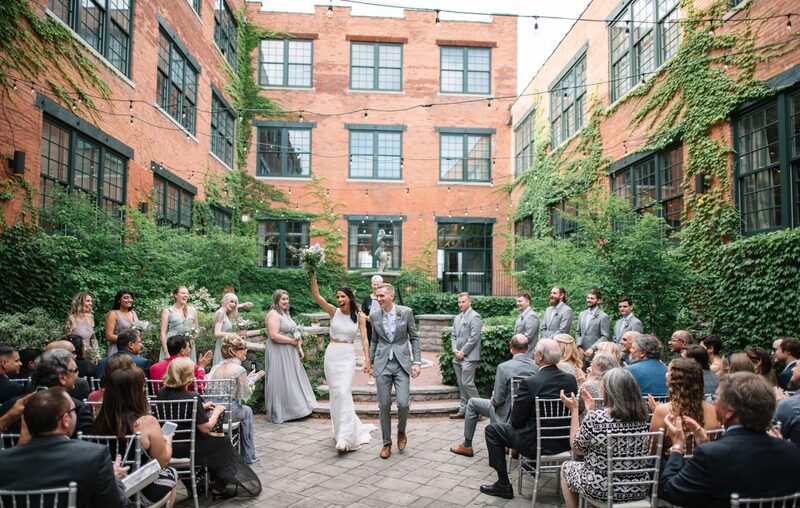 In a meaningful nod to her Persian heritage, Anita and Brian incorporated the tradition of feeding each other honey—to represent the everlasting sweetness of marriage—into their ceremony. To keep with the informal air, Anita let her bridesmaids select their dresses—first narrowing it down to designer and colors to ensure a cohesive end result. “I wanted them to feel comfortable and confident,” she says. Since music is central for the couple (they went to a concert for their first date), Brian selected all the songs for their wedding. They were using a full dance floor as an easy barometer of a good time—and their guests delivered, dancing until the very end. After the last song (“Mr. Brightside”) finished, the maid-of-honor started a Buffalo chant—just like you’d hear at the end of a music event. It quickly picked up among their guests...and soon lead into the impromptu real last song, “Shout.” For Anita and Brian, who grew up in Buffalo but now call Albany home, it was an unexpected yet perfectly fitting endcap to their wedding day. “It was absolutely what I wanted it to be, and much more than that,” she says.